Introducing the DAX Carbon fiber hard hats build with race inspired technology. This is an actual hard hat made with lightweight carbon fibers. Each shell is hand made giving them a one of a kind appearance. This is a top of the line hard hat weighing in at 17 ounces. Once complete this hard hat is covered in a matte gloss for added protection. 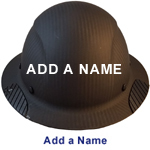 The cap style hat Meets ANSI Class C ANSI regulations for a Type 1 hard hat. In addition each hard hat comes with a rim grip on the left and right hand side where a person would normally grab the hard hat. This helps to both keep the hard hat surface clean, but also to add extra grip for the hard hat. Each Carbon fiber hat comes with a 6 point ratchet suspension and should fit head sizes 7.0 to 8.0. The suspension comes with a soft padded top to offer additional cushioning for the head. This is truly an impressive hard hat. Click the button below to add the Actual Carbon Fiber Hard Hat - Cap Style Glossy Black to your wish list.